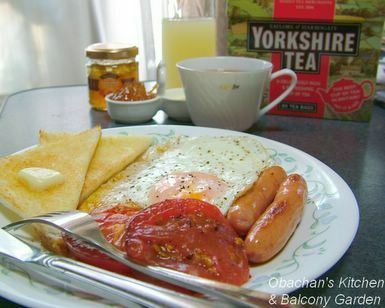 Obachan's Kitchen & Balcony Garden: English Breakfast? I got some awesome presents from my good friends from England yesterday. 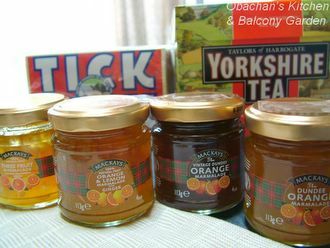 Two huge boxes of English tea that I have never tasted before, and four jars of marmalade! Can you imagine how delighted I am? To express my gratitude and also to fully enjoy the presents (both tea and marmalade together), this morning I made myself an English breakfast… or at least, something close (hopefully). The problem was that I have never been to England, and was not sure what a typical English breakfast is like. I assumed that the “continental breakfast” served at Japanese hotels may be close, but I was not sure. So as usual, I turned to my most reliable helper – the search engine. Therefore, the ideas for my English breakfast today came from this site and several other sites. Whether this looks truly English or not, I really enjoyed the breakfast and that's the most important thing, I guess. 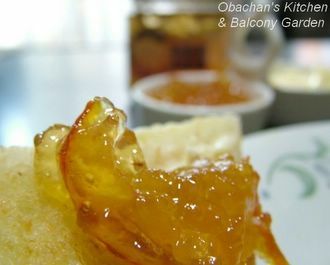 The tea and marmalade (I tried three fruit marmalade today) tasted much, much better than the ones I usually buy here, and I know that the kindness and friendship that brought those souvenirs all the way from England to my humble kitchen in Kochi, Japan also added so much to their taste. Having this breakfast was certainly a great way to start the day. 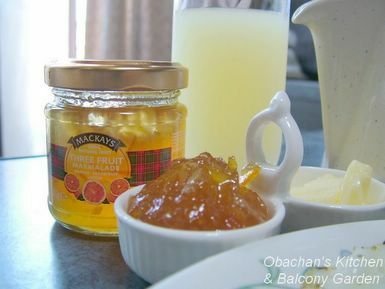 Dear OBachan, you made me smile when you say you pour soy suace over your breakfast eggs, i do that too. I am singaporean but i live in the UK, your english breakfast is VERY english. eggs, sausages, tomatoes, toast, are the most common items of an 'EB'. Other things include baked beans, bacon, mushrooms and fried bread. Keep up the good work, from May, who is fan of your blog. Great friends! Lucky you! I like soya sauce on fried eggs too!! But my favourite is Maggi Seasoning... I like it so much that I make things that can go well with it..or else, I may have to drink it from the bottle..just kidding. Lucky you!! You have very nice friends! The breakfast looked delicious...and very "English" like with the toast on the side! BUT, I have yet to try out themeatguy.jp - he has wonderful looking sausages, and delivers anywhere in Japan for a small price. 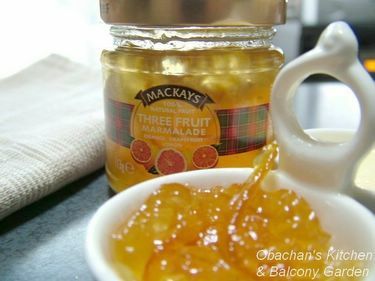 And I'm so envious of all the lovely marmalades you've gotten - they look so tempting! And I think soya sauce on eggs are one of the best ways to eat eggs! In Canada, all the diners serve variations on English breakfast, but you don't often see beans with breakfast here. You do see eggs, bacon, sausage, toast, and homefries a lot. So strange to realize that some people don't think of those foods when they think of breakfast! Yep, I’m lucky to have such nice friends. I know how you feel about the sausages! I miss the ones I had in the states. Themeatguy looks interesting. Let me know what you think if you gave it a try. Thanks again for your friendship. Good luck with the dance! I’m sure it will be an unforgettable memory. Hurrah! One more vote for soy sauce + eggs! Wow your breakfast looks so .. 'bright'. I just had pancakes today .. -_-" Ha! now i'm not sure if thats english or American ? So lucky to have jellies and jams from England! I think that an English breakfast sometimes have some baked beans (small beans simmered over night with molasses)too. Sausage, eggs, toast and English tea is perfect! When I eat breakfast and/or take food photos in the morning, I always sit facing the big window to the balcony, so my photos get lots of lights. You mean pancakes for breakfast? To me it sounds more like American, but maybe people eat that kind of breakfast in other countries, too. Right? Until I googled about Enblish breakfast, I didn’t know that people eat baked beans for breakfast in England. To me that dish always reminded me of the South in the U.S.
Pork sausages rox my soxs.. hehehe.. I'm on of those that pour soysauce on my eggs too... Poached, half boiled, hard boiled, sunnyside up, scrambled... you name it! I thought I was weird... thank goodness! A typical "English Breakfast" does often contain baked beans, however these are not quite the same as the ones you get in the southern US. "English" baked beans tend to be the Heinz type, very rarely homemade, they come in a tin & are small white beans in a thick tomato sauce. They are fairly plain, with a sweetish but savoury taste, & a hint of flavour from herbs & spices (not sure exactly which herbs & spices, it doesn't say in the ingredients). Scones are not normally served with this style of english breakfast, although I'm sure some people eat them at breakfast. English people don't traditionally eat pancakes at breakfast, although I expect it has become more common as American culture exerts its influence! Fried bread IS a very common accompaniment, although less so these days as people become more concerned about their health. To be honest, most British people these days just eat cereal or toast & jam; the "full English breakfast" is more commonly eaten in cafes (esp. those known as "greasy spoons") and are much more popular with men than women. Confusingly, many people, myself included, are much more likely to eat it for lunch (or maybe brunch) than for breakfast! Soy sauce on fried eggs sounds very tempting - I might have to try this next tome instead of ketchup or HP sauce (brown sauce, like a much stronger, spicier version of ketchup). You made these points very clear to me. Without you, I wouldn’t have known the difference between American baked beans and English baked beans. I’d assumed that full English breakfast is probably more popular with men. A nice try but you have made too much effort in the presentation. Try a blindfold when plating up for that authentic English look. A classic meal however it is served. HP sauce is a lot like tonkatsu sauce! It's also known (since HP is a brand name) as 'brown sauce'. I think the one thing you're really missing is bacon. Bacon and eggs is the minimum for an English Breakfast, but yours is a pretty good approximation. Scones are more of an afternoon tea kind of thing, but you'd probably have toast and jam with breakfast. If you do want to try fried bread, it's very easy. Simply butter a slice of white bread on both sides and fry it till golden and crisp. It's a savoury dish, so don't put jam on it, but it's good dipped in a soft egg. Yorkshire Tea is delicious, and it is very good if you have hard water (with a lot of limescale). I don't know how common that is in Japan. Thank you for the information, Lizy.